Mobility scooters are increasingly used by individuals who have limited function or a condition that impairs their ability to walk unassisted for a distance. People who have whole-body disabling conditions, such as severe arthritis or coronary problems, but are able to stand and walk a few steps, can find these scooters very helpful for getting around. Medical scooters are also useful to individuals who lack the arm strength or shoulder flexibility to operate a manual wheelchair. Along with mobility scooters, motor vehicles, cyclists and pedestrians need to be aware of their respective rights and responsibilities with regards to safe travelling, so that accidents and injuries are minimized. More and more, seniors and other individuals who were previously homebound or restricted by their condition, are now able to travel to grocery stores, malls and almost anywhere accessible by sidewalks. Like wheelchairs, mobility scooters are subject to the same rules and laws under the Highway Traffic Act as pedestrians. Correspondingly, automobiles need to extend the same courtesy and right of way to mobility scooters as they do to pedestrians. This means that drivers must generally yield a right of way to medical scooters and wheelchairs at an intersection. Nonetheless, scooters need to give automobile drivers a chance to stop before proceeding to cross. The Ontario Ministry of Transportation recommends that the sidewalk is the best choice for anyone using a medical scooter or wheelchair (http://www.mto.gov.on.ca/english/vehicles/wheelchairs-and-medical-scooters.shtml). Where there are no sidewalks, scooter and wheelchair drivers should ride against oncoming traffic on the left shoulder of the road, and return to a sidewalk as soon as possible. Like pedestrians, these vehicles should cross at intersections and traffic lights, rather than in the middle of the block. Occasionally, mobility scooters are seen driving on the road. In such cases, scooters may become a danger to vehicles and particularly, to themselves as drivers are unprepared for them in this context and may not see the scooter until too late. Scooters may also be defying local bylaws by driving on the road where sidewalks are available for use, and in the event of an accident, this unlawful action may hurt their case for damages. Bylaws have been established in many municipalities, outlining where medical scooters and wheelchairs can and cannot go. In Owen Sound, although City transit and other facilities have been made wheelchair accessible, as of August 2015 there are no specific bylaws for medical scooter and wheelchair travel on roads. When in doubt, drivers of these vehicles are recommended to adhere to pedestrian guidelines. Unfortunately, even when practicing safe and appropriate travel, scooters, like pedestrians, are at risk of being hit by careless drivers, particularly when we consider that almost 20 per cent of road fatalities in Ontario are pedestrians. An Owen Sound resident in a mobility scooter was crossing at a 10th St E intersection on the ‘walk signal’, when her scooter was hit by a truck driver. After having stopped for a red light, the driver proceeded with a right hand turn, without having seen the woman on the scooter. The scooter became wedged under the truck’s front bumper and the woman was knocked off her scooter. The scooter was significantly damaged but the woman’s injuries were not life-threatening. The truck driver was charged with failure to yield to a pedestrian. The scooter driver was taken to hospital to be examined after the incident, which is always the best decision even when injuries do not appear to be serious. If untreated, some injuries worsen over time. Older adults are particularly vulnerable because, as we age, we are more prone to fractures and injuries due to decreasing muscle mass and bone strength. Fortunately for the Owen Sound woman, the truck was travelling very slowly, greatly decreasing the force of impact to her body. When a pedestrian or another exposed person, such as someone in a medical scooter, is hit by a vehicle, the severity of injuries will vary with factors such as the speed of the vehicle, the part of the body that is first hit and the vehicle design. Possible injuries are head and neck injuries, traumatic brain injury, back and spinal cord injuries, chest and abdominal injuries, and injuries to the legs and pelvis. Brain injury is the most life threatening injury that often occurs. We need to share our roadways with different forms of transportation: trucks, cars, mobility scooters and wheelchairs, bicycles, motorcycles and pedestrians. In order to do this safely, we all need to be alert and respectful of these other uses. Pedestrians and mobility scooter/wheelchair drivers are particularly vulnerable to catastrophic injury or death if hit by any kind of motorized vehicle. 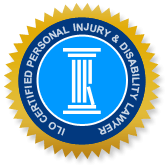 If you or a loved one was severely injured in any type of an accident, due to the carelessness of another individual, the Personal Injury Lawyers of Ontario (ILO) law group will help you to get compensation for your damages and injuries. In our initial (free) consultation, we will determine whether you have a viable suit for damages and together, we will plan a strategy for your successful claim.